It was a very busy holiday season. I finally have some time to be able to start blogging and being able to share what I was up to from September through December. 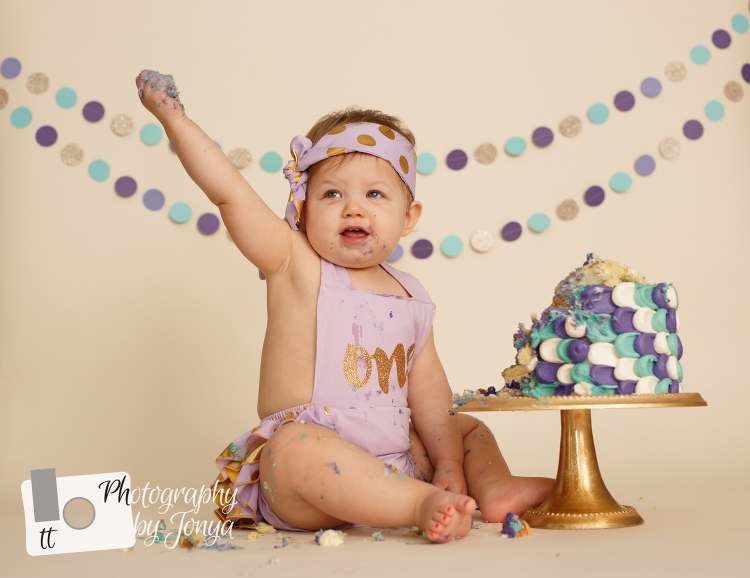 Although I was so very busy with family sessions, I had so much fun also shooting so many cake smash sessions. I am really excited to be able to share some of the “sweetness” with you all. This is one of those cake smash sessions. Meet Leila! She is was so very shy and a little off guard with the cake smash. When this happens, and it does a lot, we let them decide the pace of the session. Sure, would we want them to dive in and love every second of it? Of course!! But when it doesn’t, we let them decide the pace. And they always come around. The first cake smash we had scheduled, she started too feel under the weather a few days before the session. Mommy did exactly what I ask all of my clients to do, reschedule when the baby is sick. This not only protects all other babies and children that come into the studio, but it allows us to get better quality images form the session. And let’s be honest, NOBODY wants to be in front of the camera when they are sick. We were so happy that we waited a little over a week… when she was feeling completely herself. 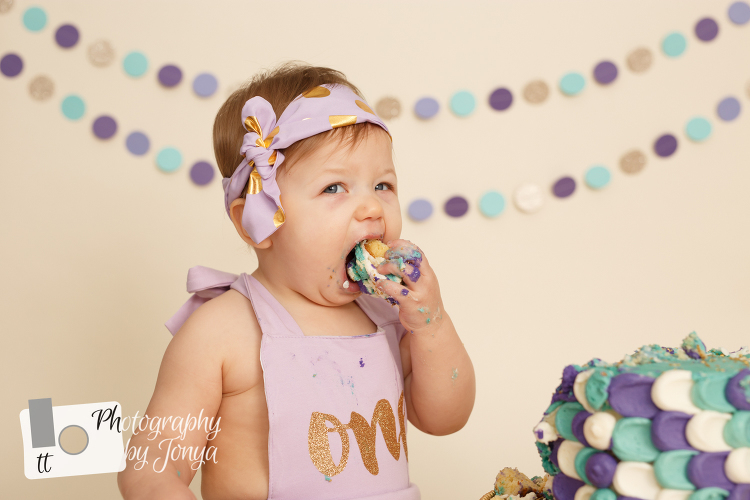 During the cake smash, she continued to watch me and the camera… making for some precious, and honest shots. The cake smash colors were gold, teal and purple. 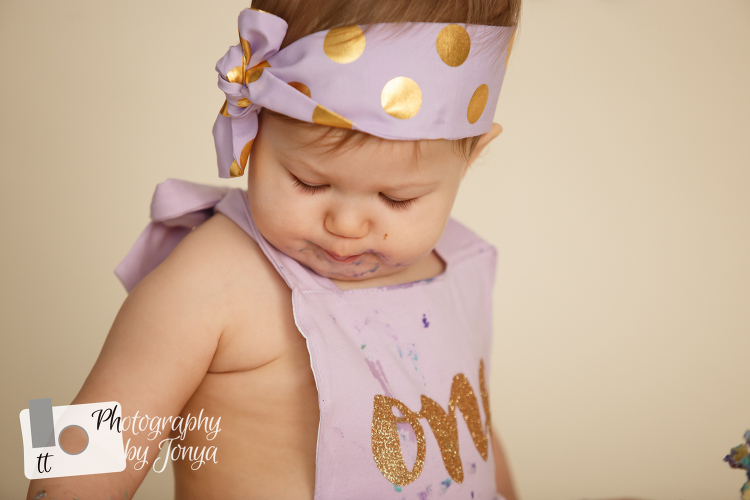 We were able to tie her cute lavender and gold polka dot outfit, that her mommy found on Etsy with a custom made paper banner, also from Etsy. The cake for this cake smash was made by Baked By Billie. She delivers cake smashes directly to the studio. This is perfect for all Raleigh cake smash sessions.